Del Norte was a great stop after the past week of finding it difficult to get supplies, after a substantial breakfast of omlette and banana pie at ‘Boogies’, we set off full of enthusiasm and plenty of calories! We were expecting a fairly easy day looking at the gradient profile, but we should have known by now not to take anything for granted, as although it wasn’t steep, the track was fine loose gravel several inches deep. This was anything but easy to ride on, but we had amazing views over to the Sawatch Mountains to keep ourselves motivated. After a few miles the surface improved and we climbed up towards Carnero Pass making good progress. We could see another storm brewing up ahead which we hoped to miss, but as we neared the summit at around 3100m the hail started falling. 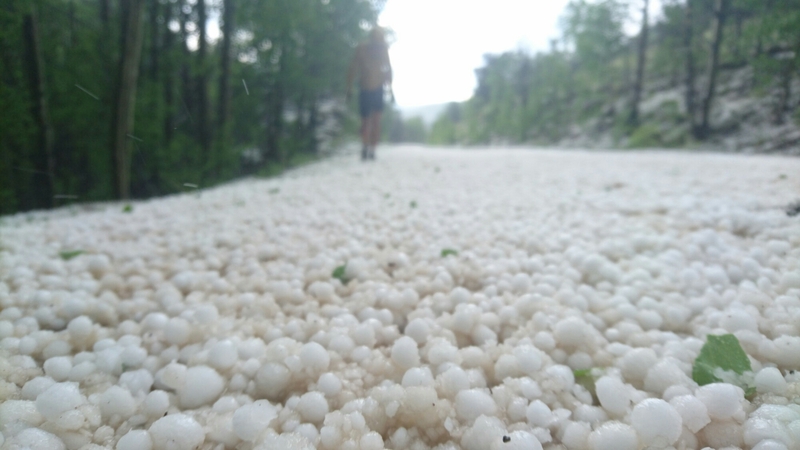 This was a bit of a novelty at first, as we sheltered in the trees listening to the thunder, but of course these were not small slushy English hailstones, but rock hard and marble sized! It was really starting to hurt as the storm got more intense, and although it was all over after 15mins, it left a deep layer of ice that wasn’t going to make the riding any easier. 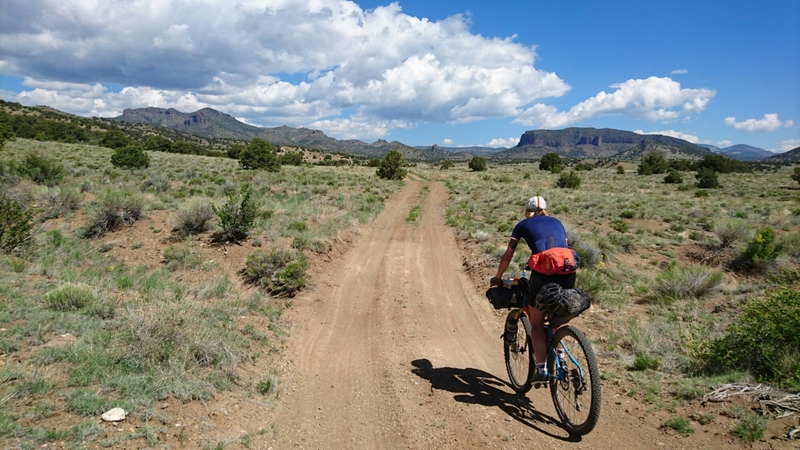 We pushed on, bikes gathering mud again, but at least this wasn’t the New Mexico sticky kind. The sun eventually came back out, however so did the mosquitos, and as we climbed the final 10 miles of the day to Luders Creek campground a car pulled up and handed us some insect repellant. They had seen us trying to fend off the airborne assault as we rode, we couldn’t outrun them on the steep terrain! Luders Creek was a good spot, the couple that gave us the spray had also left us some water and firewood at the campground which after 64 miles was a nice end to another eventful day! Day 15 was the first morning that wasn’t bright and sunny, we waited for a break in the clouds to dry the tent out, but had to give in and set off with damp gear. Still at over 3000m meant a good descent first thing, then some easy going tracks to make the 50 miles to Sargents by 2pm. 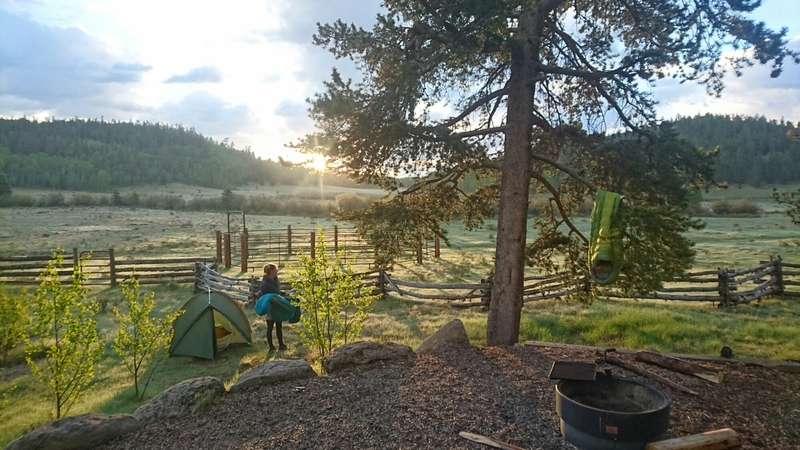 We had hoped to camp or get a cabin here, but as we arrived early we were considering pushing on another 35 miles to Salida, where we could be sure of somewhere nice to stay, and plenty of options for good food. We started to chatting to the guy in the petrol station, whilst we scoured the shelves for some variation on our Clif Bar/Trail Mix diet, “Salida?, forget it, no way you’re making it tonight, you’ve got twenty eight hundred feet to get over first!” this wasn’t said in a jokey way, but a direct and serious fashion, that made our minds up – Salida it was! 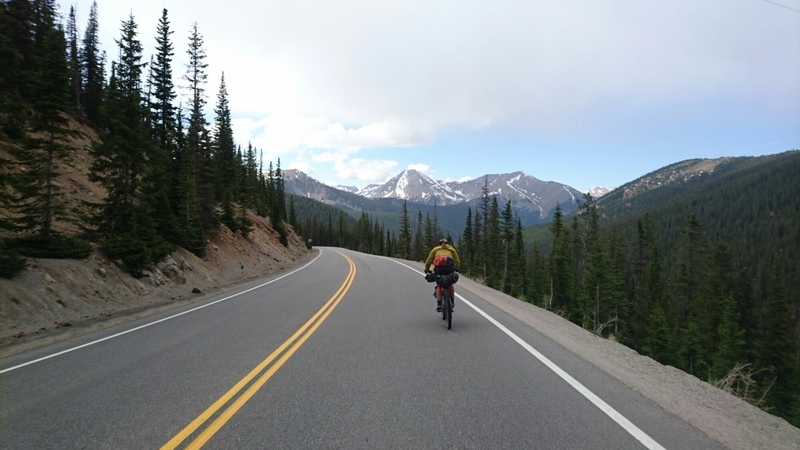 We took the highway to save some time over the suggested off road route, which took us up another 10 mile climb over Monarch Pass. Although this was tough going after a 50 mile day, a couple of hours of spinning and we made it to the top. What followed was I’m pretty sure the longest descent of my life, 23 miles of tarmac, downhill all the way to Salida! 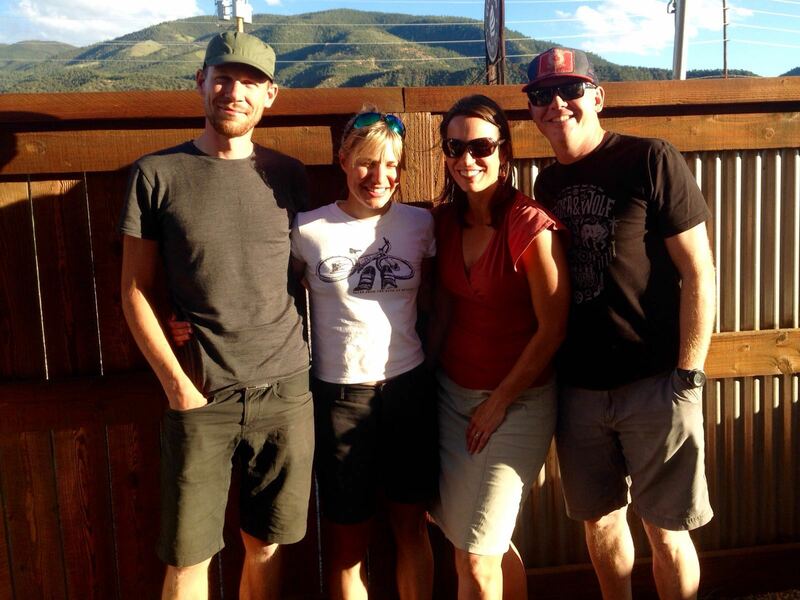 This was a great end to our 80 mile day, and after 15 days and 970 miles on the bikes decided we had earned a day off! 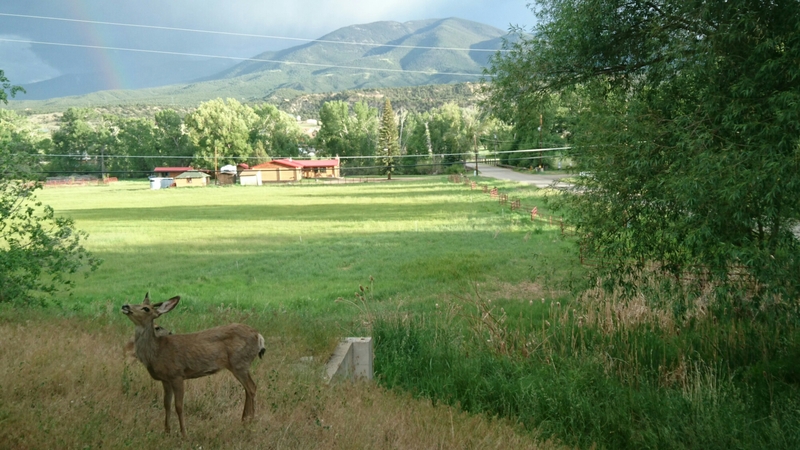 We stayed at the Silver Ridge Lodge which had a great view, complete with local wildlife! It was good timing as Salida is a lovely town. 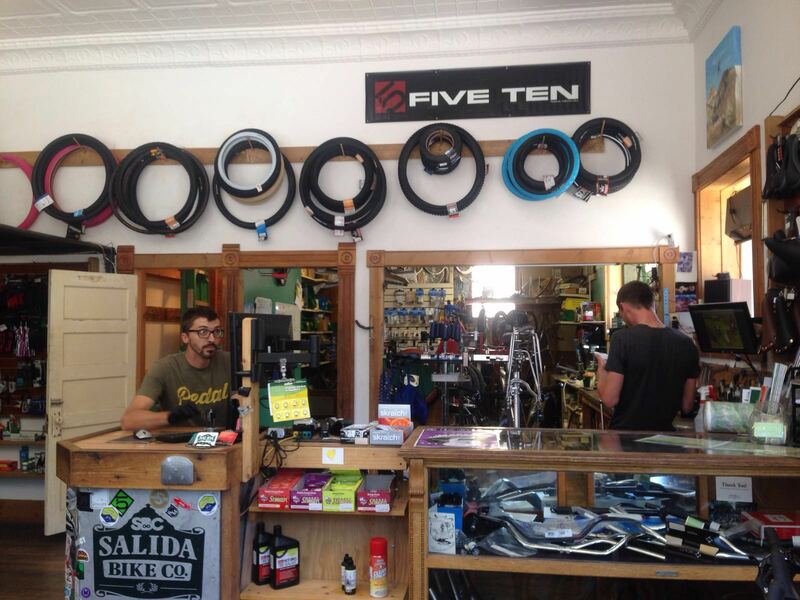 We spent the day browsing the 3 bike shops, with Anton at Salida bike company kindly letting me use his workstand to replace my brake pads – thanks! In the evening we met Nathan, the man behind the film ‘The Rider and the Wolf’ who Magda had interviewed for work via email a few months back. He and his wife were great company at the local micro brewery/bar and it was a great day to recharge and relax after a third of our journey completed. Phew well done………..80 miles looks nothing on the wall map though!,! And its all up hill as well.! Mum ought to ride the equivalent distance of your trip to Eastbourne and back to see how long it would take.. l expect she can provide a mathematical answer to that. I nearly did – last Friday night! Cycled 35 miles intending to get the train home but hadn’t anticipated Southern Rail problems. Trains cancelled with bus replacement but no amount of persuasion would make the bus driver allow my bike on his bus so there was only one way back. Bit saddle sore (and jelly legged) Saturday morning! Nearly did – last Friday evening! Cycled 25 miles intending to get the train back but hadn’t anticipated Southern Rail problems. No trains, replacement bus service but no amount of persuasion was going to make the bus driver allow my bike on his bus so there was only one way home. Was a bit saddle sore and jelly legged Saturday morning. Nearly stopped off in Glynde for the night! !